All Bump Products are Australian designed, soft thermal shock absorbing material, that not only protect your car from bumps and scrapes, but are also designed to look stylish on any make or model of vehicle. Once fitted, they will integrate to look like original manufacturer products. All of the Bump Product range have a strong adhesive backing that attaches to your car permanently. However, they can be removed if necessary, and will not damage the paintwork on your vehicle. Provides bump protection to your car/suv and other cars/suvs when opening doors, especially when you have kids travelling in the back seat. Great for use in tight spaces, garages, shopping centres. Saves minor/major unsightly damage. Also has majic eyes that glow in the night when light from oncoming cars shine on the protectors. Protectors come in Black, Red, Blue, Clear, to compliment the colour of your car. 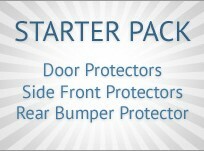 Suitable for all makes and models of cars Door Protectors come complete with built-in safety reflectors. Bump Products manufacture a range of automotive accessories which minimise costly damage to the paintwork of modern cars. The exclusive fabrication methods and design behind these products make them the number one choice to protect your vehicle.